I’m liking the charcoal Regia Silk in the waffle pattern (two rounds of knit 2, purl 2 ribbing, then two plain rounds). Hopefully I make a lot of progress on it over the weekend so that it seems worth photographing. This probably won’t come as a surprise to anyone, but my Cabernet Adamas shawl is still a ball of yarn and likely to remain that way for a while, so no more Amazing Lace for me. And I still need to knit some Bitchin’ (baby) Mittens – yikes! Oh well, at least I finished the TrekAlong, right?! 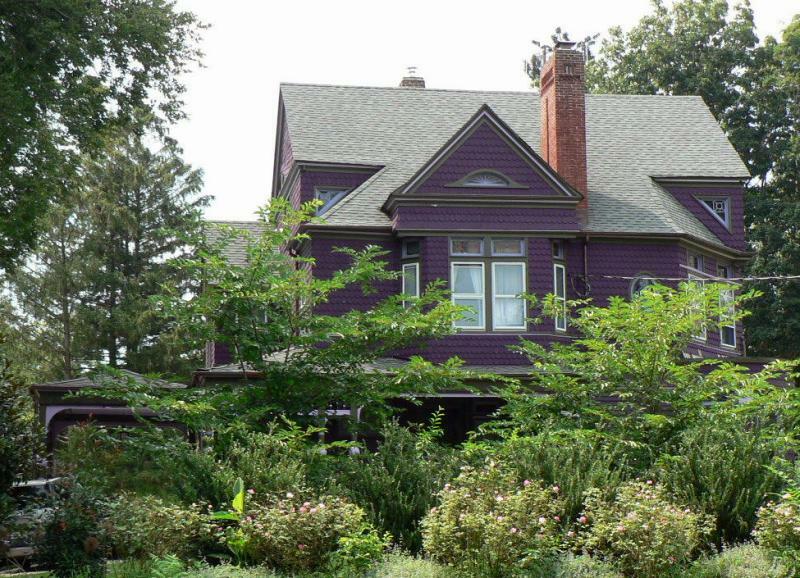 I still have a few more local purple architectural features to take pictures of, but to tide me over until I get around to it, Trek sent me this purple house from New Jersey. We should all forgive her for the slightly illegal action she took to get this photo, becase I love this house. Thanks, Trek! And how could we end the week without a little Chaos, looking ever-so-sweet after his shenanigans of a few days ago… Have a great weekend, everyone! Posted by Chris on Friday, August 18th, 2006, at 6:58 am, and filed under Knitting, Reading, Reviewettes, Tales of the Neighborhood. Wow – that motorcycle picture is really cool, and I love the purple house! Liz (Dalai Mama) is also have a contest. Congrats on the pattern acceptance! Congrats on your pattern in MagKnits! Chaos does look a little sweeter than that last “attitude ” picture. Have a good weekend. Congratulations on your Magknits acceptance! That’s awesome! 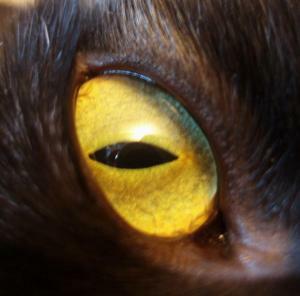 Chaos – there is no such thing as an innocent cat. Chris – congrats on the MagKnits. Glad you like the purple house. We shall not speak of how it came to be a digital photo. Sh! You’re so full of secrets … Congratulations! Congratulations on the pattern!! Very cool. Oh my god, thank you for that fish mitten link!! I must knit them, MUST. I like that overgrown motorcycle too, reminds me of a series of alternate history books I was reading last week (SM Stirling’s “Dies the Fire”). 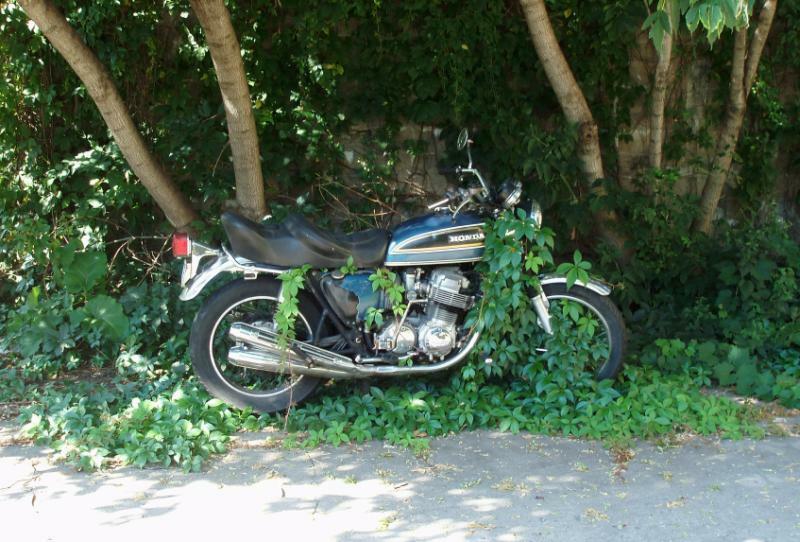 The overgrown motorcycle reminds me of the overgrown ice house up the street. Nice gift package for Knit-Whit BTW! Love the motorcycle, though it makes me sad that it isn’t being used. I LOVE Charles DeLint!!! And aren’t the furry folk SO good at looking “ever-so-sweet”? Probably a defense mechanism, dontcha’ think? I can’t wait to see your pattern!! Congratulations on the published pattern!!! That’s so awesome – and I LOVE a pattern I can knit with one skein of Noro! Shocked! Shocked! You’ve not knit on the shawl! No! Really! Love the motorcycle photo. Good luck on your bitchin baby mitts! The fish mittens blew me away, they were so cool. Does that motorcycle have an owner, or is it just like, a trellace? Did I spell that right? Trellace? Hey cool, congrats on the pattern! Can’t wait to see it! oh…Cool about MagKnits! And um…yeah right. Chaos the innocent – hehehehehawhaw! Congrats on the fabulous lookin page chris!!! it’s awesome! good work! congrats on the pattern acceptance–I can’t wait to see it! I can’t wait to see your pattern! I love the motorcycle pictures — there must be a good story there because if it’s not being ridden in the summer in Minnesota, when will it be? And congratulations on the pattern! I have a ball of Kureyon that I was going to send to my SP, but maybe I should hold onto it! Oh — and I meant to say that Cute Library Guy is probably very nice – most Library Guys are — so talk to him!! Congratulations on your pattern in MagKnits! **woohoo! ** Fish mittens wow! Congrats on the Magknits acceptance! Chaos is too sweet to ever do anything bad. Aren’t those fish mittens amazing? And so is that motorcycle and that house. Way to go on the pattern!! Hmm, we’ve been wondering what to do with the motorcycle that has been languishing in our basement for the last few years. We can toss it into the “jungle” next door to the new house and have a unique sculpture in a few weeks. I see the cute favicon! Congrats on the pattern! Woo Hoo! ooh contgratulations! I can’t wait to see the pattern I have lots of kureyon waiting for me to figure out what to do with! omigosh, i just read all the haiku. poor chaos will never, EVER live down the bib. Congratulations on the pattern. Way to go! How can you ever think that Chaos would cause trouble?! Oo! Oo! It DOES look like something from Charles deLint. Or Emma Bull. That is SO cool!! Congrats on the pattern in Magknits. Chaos looks so harmlees in that picture. Hey Chris- Congratulations on the pattern- well done. So sweet! No hint of shenanigan whatsoever! He looks so sweet and innocent! Kind of how Max looks when she’s sleeping. Love the motorcycle. Talk to cute library guy already! That motor bike is very charles de lindt, isn’t it? I love old Hondas!! i have 2. i want to rescue that one from the weeds. Oh that poor Honda, someone should really rescue it from those vines.